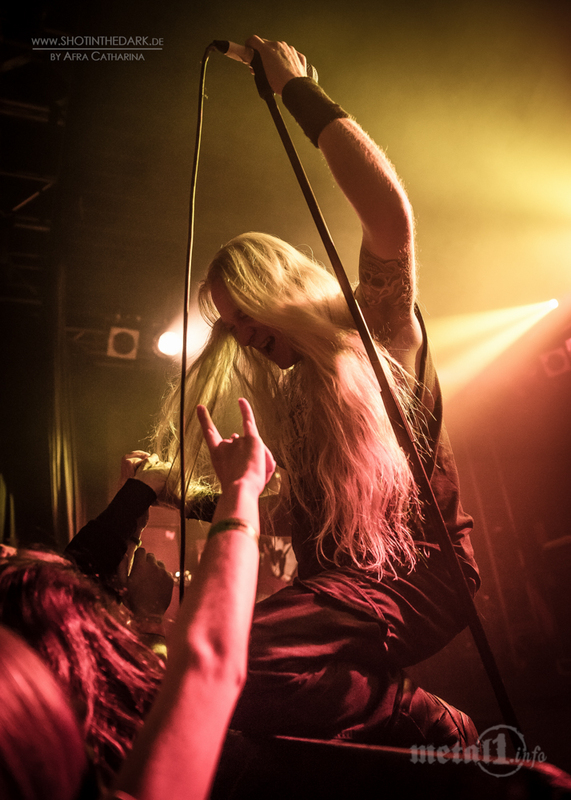 Founded in 2012, the DARK EASTER METAL MEETING is now one of the largest German indoor festivals in Black and Death Metal. 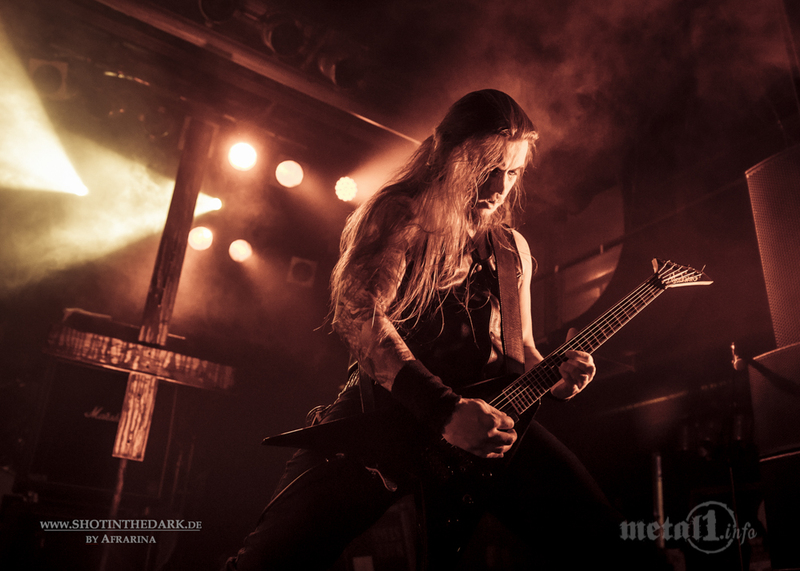 Founder and organizer Michael S. gives insights into the structures of the event, his selection criteria for filling the schedule and his highlights from seven years of DARK EASTER METAL MEETING! How many tickets were sold for the DARK EASTER METAL MEETING 2018? For the DARK EASTER METAL MEETING 2018 1,500 two-day tickets were sold. This contingent of tickets will also be available for the DARK EASTER METAL MEETING 2019. In 2018 the event was sold out five weeks before, so – in contrast to 2017 – there were no day tickets available. We assume that the festival will be sold out again in 2019 and therefore there will probably be no day tickets – neither in advance nor at the box office. Are you at the limit with this contingent – and if so: Are there any plans that would enable further growth of the DARK EASTER METAL MEETING? Since the DARK EASTER METAL MEETING 2018 year we are at the limit. A further growth, which we are not currently pushing, would perhaps be possible after the commissioning of the future additional Backstage location, the Arena. 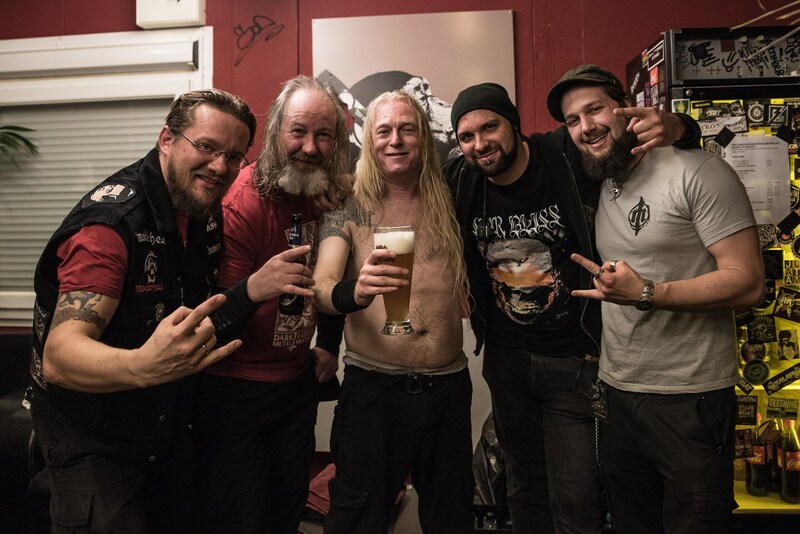 From left to right: Nick (band management and others), „Sturmi“ (band management and others), Karl Willetts (MEMORIAM), Michael (booking and others) and Moritz Grütz (Metal1.info) at DARK EASTER METAL MEETING 2017. What the DARK EASTER METAL MEETING cannot offer is a camping possibility – do you regret that? No. (Indoor) festivals that invite you to stay at the campsite because of a rather average program or degenerate into a mud battle because of bad weather, there are more than enough of them already. At the DARK EASTER METAL MEETING the performances of the bands and the meeting of metalheads and bands from all over the world are in the foreground before and off stage. For example at one of the many bars or in fine weather in the beer garden on the cosy, winding grounds or during the autograph sessions at the Metal1.info stand. Within walking distance, sometimes only a few minutes on foot, there are several hotels, guesthouses and a youth hostel for our visitors. Since 2017 the DARK EASTER METAL MEETING has been going over two days, during which there is some overlapping in several halls – nevertheless there were already admission stops. Do you understand the anger of some fans and how do you try to avoid that? I understand the anger of these few fans only conditionally, but of course you try to avoid that. Thanks to a well thought-out schedule, our visitors can see 29 of 34 bands without overlap. Compared to other (indoor) festivals, this is not a matter of course and is very well received by the majority of our fans. After admission the locations of the size fill up one after the other, which is why the hut is full right from the start and the mood is good, especially to the great joy of the bands. Every visitor can get into the biggest location (work) at any time without any problems. If there is no band performing in the work, the middle (hall) and small location (club) will be played in parallel. Here it can get very crowded, but also here you almost always get in without problems, because here the rather unknown bands play and parallel autograph sessions with the more known bands take place. It’s sometimes a straight walk to estimate the appropriate slot and the pulling power of a band, but I think that’s mostly good to very good. As far as I know, due to overcrowding only at Mgła (2016) and Batushka (2017) not all fans could be allowed into the hall. This makes one or the other performance even more exclusive and cannot be completely avoided at locations of different sizes. Here’s a tip for the fans: Use the outside stairs behind the snack bar from the start to get to the gallery in the club. There is often still plenty of space here, while everything is crowded downstairs! How do you deal with criticism from the fans in general? Criticism on the part of the fans, but also positive feedback, band wishes and so on will always be listened to and if necessary will of course be improved. Some visitors criticized in the past especially the lack of food and the too long punch at the snack stand. Thanks to a second stand in 2018, more choice, variety and shorter waiting times were provided here. But what many don’t know: Unfortunately, even more food stands cannot be accommodated on the grounds because they would block emergency exits and escape routes. The fans can be sure that hardly any decision will be left to chance. Many spectators come from far away to the DARK EASTER METAL MEETING – do you have an explanation? What was the longest journey you’ve heard of? In Germany and many other countries the two festival days as well as the days before and after are holidays. Besides, there are Easter holidays. This means that people have holidays and time and can travel comfortably to and from the festival. In addition, the interesting and international selection of bands speaks for itself. But I’m already flat and a bit proud that so many fans from pretty much all corners of Germany and the neighbouring countries, but also from Eastern Europe, Scandinavia and far away countries like the USA, Mexico or New Zealand travel to Munich for the DARK EASTER METAL MEETING. Not only the demand for tickets is huge – the bands are also queuing up to perform at the DARK EASTER METAL MEETING. According to which criteria do you choose the bands? At the moment almost one fifth of the tickets are sold and requests from interested bands come daily. Both are very pleasing. However, an application rarely leads to a performance. I like to search for exciting bands myself and usually have a lot of ideas in mind already. When selecting bands, it is not important to me whether the band is under contract with Label X, has played at Festival Y or is mentioned in the (online) magazine Z. Of course I follow that too, but in many cases it’s due to my personal moods, my taste and my gut feeling, which is why one band makes it into the program and another doesn’t. I am often inspired by conversations with friends and people from the scene or the crew. An important criterion in any case is that the band in question doesn’t play at every power outlet or in every bus shelter. Often there are real live rarities or still unknown bands, which go steep later. How do you open up such still unknown bands, how much time do you invest in the search? Finding the bands, whether still unknown or already known year after year, is a lot of work. My approach is that the DARK EASTER METAL MEETING, with its mixture of legendary scene greats and underground heroes as well as promising, yet unknown newcomers and pearls from all over the world, represents the greatest possible variety within the defined genre boundaries of Black-, Dark-, Death- & Doom-Metals. Do you have a fixed budget from the venue, Backstage Munich, with which you can work? What was the most expensive band at the DARK EASTER METAL MEETING so far? There is a rough financial framework, but it also leaves room for manoeuvre. Most recently, the respective dayheadliners Paradise Lost and Bloodbath have made their mark. And which promise did you personally enjoy the most? What was your personal concert highlight at the DARK EASTER METAL MEETING and has there ever been a DEMM show that really disappointed you? I would have been very much looking forward to Katatonia! (laughs) As „substitute“ Paradise Lost played after their cancellation – a band that has been with me since my teenage days. 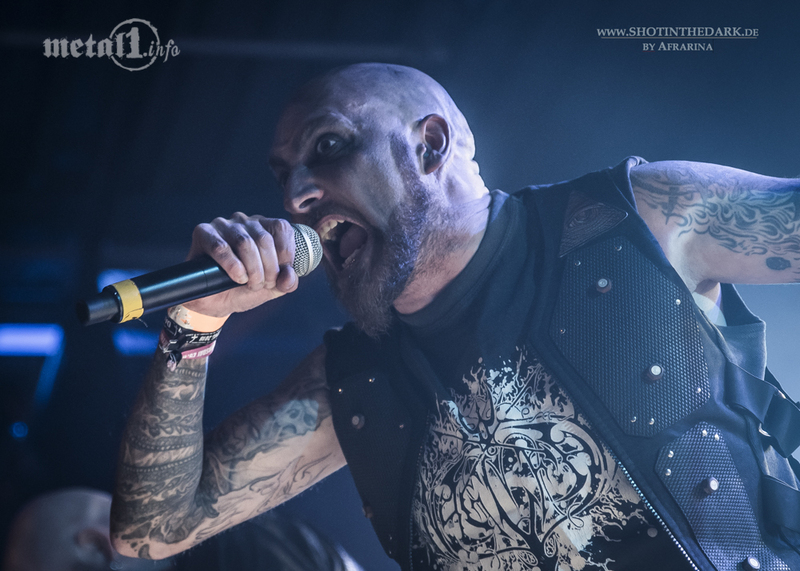 Even though I have seen Paradise Lost live almost ten times and their performance at DARK EASTER METAL MEETING is unfortunately not among the best, it leaves a very special feeling in me to suddenly be the host of this legend. Absolute highlights for me were the two gigs of Bethlehem 2013 and 2018. It was exactly five years to the day between these two shows, by the way. Jürgen Bartsch is a really cool guy and feels very comfortable at the DARK EASTER METAL MEETING according to his own statements. Generally I’m also happy about the many promises of bands that have been around for years or even decades, but for inexplicable reasons never made it to Munich (Bloodbath, Asphyx, Aura Noir …) or not for ages (My Dying Bride, Naglfar …). Basically I am happy about every acceptance of the handpicked program. Spontaneous cancellations belong to the horror scenarios for festival organizers – how do you protect yourself against them? You can’t protect yourself against that, at least we don’t do it. However, you should be well connected with local band members and booking agencies in case of an emergency. Often a cancellation is announced weeks in advance and you still have enough time to react. I think it was almost a miracle that in 2018 we could conjure up an „alternative program“ consisting of Paradise Lost, Shining and Aura Noir for Katatonia, Taake and Helheim. Such luck is rather rare. I remember, for example, that in 2017, after Gehenna’s cancellation, I had asked dozens of bands for days until the redeeming message came in the form of a promise from Ravencult. At the end of the day you’re very happy about every band that takes over within a short time. Many thanks at this point to the guys from Asphagor and Wolves Den, who jumped in spontaneously in 2018 after the extremely short notice sick cancellation of Dawn Of Disease and the Nocturnal Depression that was submerged in the water. Both thumbs are crossed that in 2019 everything will go according to plan again, but unfortunately you are not in it. 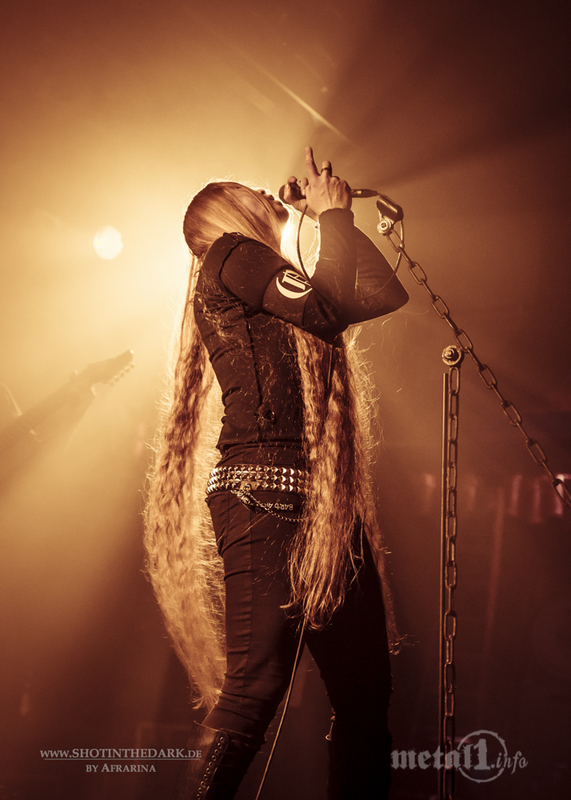 When does the work on the next issue of DARK EASTER METAL MEETING start for you after an edition – and what does it start with? The work is a constant process and starts before the next issue with considerations about the program, first bookings, viewing and answering applications and much more. How far have the plans progressed at the moment? With 24 out of 34 bands, the majority of the programme has already been decided. Among others Triptykon, Unleashed, Taake, Tsjuder, Necrophobic, Harakiri For The Sky, Darkened Nocturn Slaughtercult, The Ruins Of Beverast or Sear Bliss are confirmed. I am especially excited about Advent Sorrow from Australia. But there are one or two surprises left. When the booking is completed, we will unveil the new flyer and poster design, intensify advertising and work on further details for the next issue. So you can stay excited. How many helpers are now involved in DARK EASTER METAL MEETING all in all? The pre-production is done by Daniel from Backstage and me. The booking, the correspondence with bands, dealers, media partners, the support of the Facebook page and many other things are done exclusively by me. There’s also our graphic designer, who handles the entire pre-production for various orders, as well as the backstage team, who for example take care of the ticket systems, check the bands‘ technical requirements and so on. For some time now there has also been a representative for our new account at Instagram. During the festival there are thankfully ten to fifteen volunteers from the local metal scene – some of them longtime friends of mine – involved as stagehands, merchandise-sellers, construction helpers, jumpers and much more, as well as sound, light and monitor technicians, production managers, backliners, stage managers, shuttle drivers, bar, catering and security staff paid for their work. How much time do you personally put into the DARK EASTER METAL MEETING and do you get paid for it, or is the DARK EASTER METAL MEETING still a pure hobby for you? What drives you, if not the financial one? A lot of time. I’ve never added up the hours I work at DARK EASTER METAL MEETING, but it’s quite a time-consuming hobby. However, my motivation has never been of a financial nature. It is rather the love for music and concerts in general as well as the many fans and bands from all over the world, who praise you personally for the organisation and thank you for the invitation, that I do this year after year. What is the funniest anecdote from the event history of DARK EASTER METAL MEETING? 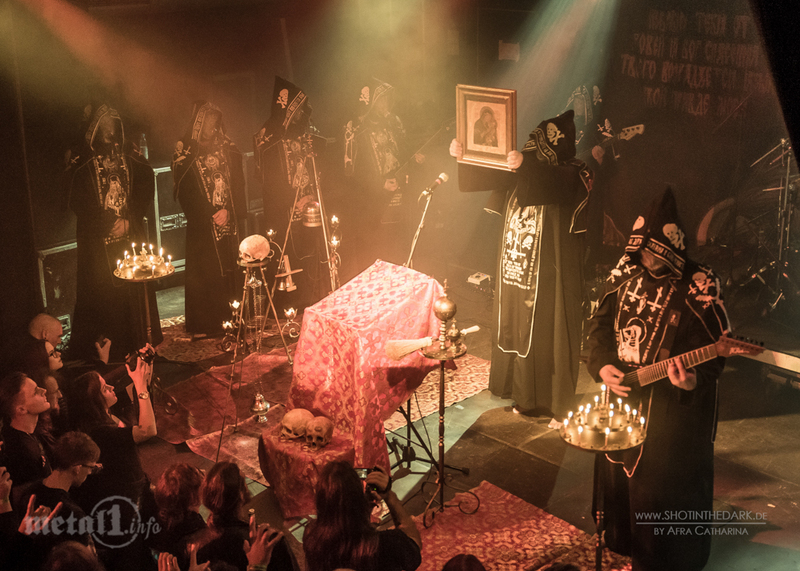 A funny anecdote of the crew is, for example, the story with the „disappeared“ aftershow pizza for Batushka. The thing was less funny, but rather bizarre, when a member of a relatively well-known band apparently insulted me without any reason during the pre-production in e-mails and threatened me with violence. He obviously enjoyed drinking one about thirst from time to time. But then we were able to clarify this personally on site. The band felt comfortable with us, played a really strong gig and everything was good. Would you have thought after the first edition that the DARK EASTER METAL MEETING would one day become such an instance in the German indoor festival landscape? No. After the first edition it wasn’t even planned that the DARK EASTER METAL MEETING would take place annually, but various factors have led to this happening. At this point I would like to thank all those involved for making this happen. In addition to the DARK EASTER METAL MEETING you will also host the TANZT!, a concert series for medieval & folk rock/metal, as well as the Metallic X-Mas. Which of the three events would you personally be most interested in as a music listener? What’s going on at home or in the car? It would probably be the DARK EASTER METAL MEETING! (laughs) In the car I mostly listen to news or nothing at all. At home and live I prefer to listen to timeless metal, rock and pop from the 70s until today with a focus on the past decades. The love for music and concerts was put into my cradle. My musical socialization began in my early childhood with artists like Bruce Springsteen, Meat Loaf, Supertramp, Gianna Nannini, Peter Maffay and many others. My first rock concert was in 1994 – at the age of eight – The Hooters, my first metal concert was in 2003 at the age of seventeen Iron Maiden. In the same year I also saw inspiring concerts by the Rolling Stones, Bruce Springsteen, Meat Loaf, Bon Jovi, Deep Purple, Whitesnake, Jethro Tull, Alice Cooper, Yes, R.E.M., Placebo and several others. I discovered this „medieval stuff“ – at the beginning Schandmaul and Subway To Sally – at about the same time and to the extreme Metal I found only with about 20 years more and more access. I like a lot of different stuff. That’s also why the DARK EASTER METAL MEETING and the TANZT! are completely different from each other. Helene Fischer: We have Easter Thomas Gabriel Fischer with us again. I hope they are not related! Easter: For me since 2012 synonymous with the DARK EASTER METAL MEETING. Wacken: I’ve never been there before, but I’d like to have been there at least once. Your current favourite album: In Black Metal „The Cleansing“ by Asphagor (2018) and „Letters From The Edge“ by Sear Bliss (2018). In metal in general „Firepower“ by Judas Priest (2018). Satanism: Like every faith more appearance than being. DARK EASTER METAL MEETING in 10 years: I have no idea. Maybe no longer existing, maybe just another small one-day event. Thank you for the opportunity of the interview and your reliable work as presenter of the DARK EASTER METAL MEETING! Erst 2012 gegründet, zählt das DARK EASTER METAL MEETING mittlerweile zu den größten deutschen Indoor-Festivals im Black- und Death-Metal. Im Rahmen unseres VERANSTALTER-Specials gibt Gründer und Organisator Michael S. Einblicke in die Strukturen des Events, seine Auswahlkriterien beim Besetzen der heiß begehrten Slots und seine Highlights aus sieben Jahren DARK EASTER METAL MEETING! Wie viele Tickets wurden für das DARK EASTER METAL MEETING 2018 verkauft? Für das DARK EASTER METAL MEETING 2018 wurden 1.500 Zweitagestickets verkauft. Dieses Ticketkontingent wird es auch für das DARK EASTER METAL MEETING 2019 geben. 2018 war das Event fünf Wochen vorher ausverkauft, also gab es – im Gegensatz zu 2017 – keine Tagestickets. Wir gehen davon aus, dass das Festival auch 2019 wieder bereits im Vorfeld ausverkauft sein wird und es demnach voraussichtlich wieder keine Tagestickets – weder im Vorverkauf, noch an der Abendkasse – geben wird. Seid ihr mit diesem Kontingent am Limit – und wenn ja: Gibt es Pläne, die ein weiteres Wachstum des DARK EASTER METAL MEETING ermöglichen würden? Seit dem DARK EASTER METAL MEETING 2018 Jahr sind wir am Limit. Ein weiteres Wachstum, das wir derzeit aber nicht forcieren, wäre aber vielleicht nach Inbetriebnahme der zukünftigen zusätzlichen Backstage-Location, der Arena, möglich. Von links nach rechts: Nick (Bandbetreuung u.a. ), „Sturmi“ (Bandbetreuung u.a. ), Karl Willetts (MEMORIAM), Michael (Booking u.a.) 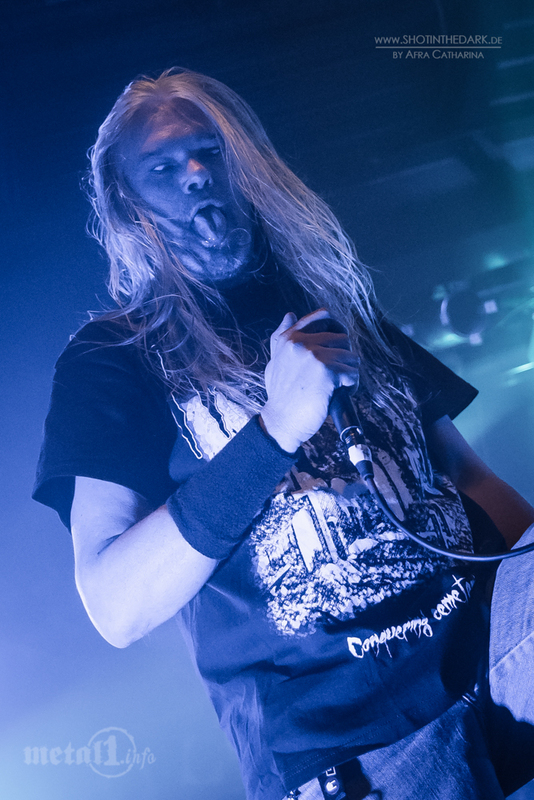 und Moritz Grütz (Metal1.info) beim DARK EASTER METAL MEETING 2017. Was das DARK EASTER METAL MEETING nicht bieten kann, ist eine Campingmöglichkeit – bedauerst du das? Nein. (Indoor-)Festivals, die aufgrund eines eher durchschnittlichen Programms zum Verweilen am Campingplatz einladen oder wegen schlechten Wetters zur Schlammschlacht ausarten, gibt es doch bereits mehr als genug. Beim DARK EASTER METAL MEETING stehen die Auftritte der Bands und das Zusammentreffen von Metalheads und Bands aus aller Welt vor und abseits der Bühnen im Vordergrund. Etwa an einer der vielen Bars oder bei schönem Wetter im Biergarten auf dem gemütlichen, verwinkelten Gelände oder bei den Autogrammstunden am Stand von Metal1.info. Im näheren Umkreis, teilweise nur wenige Minuten zu Fuß, gibt es etliche Hotels, Pensionen und eine Jugendherberge für unsere Besucher. Seit 2017 geht das DARK EASTER METAL MEETING über zwei Tage, an denen in mehreren Hallen teils mit Überschneidung gespielt wird – trotzdem gab es auch schon Einlass-Stopps. Verstehst du den Ärger einiger Fans und wie versuchst du, das zu vermeiden? Den Ärger dieser wenigen Fans verstehe ich nur bedingt, aber selbstverständlich versucht man, das zu vermeiden. Dank eines durchdachten Zeitplans können unsere Besucher 24 von 34 Bands ohne Überschneidung sehen. Das ist verglichen mit anderen (Indoor-)Festivals nicht selbstverständlich und kommt bei der Mehrheit unserer Fans sehr gut an. Nach Einlass füllen sich die Locations der Größe nach nacheinander auf, weshalb vor allem zur großen Freude der Bands auch gleich von Anfang an die Hütte voll ist und gute Stimmung herrscht. In die größte Location (Werk) kommt jederzeit jeder Besucher problemlos hinein. Tritt im Werk gerade keine Band auf, werden die mittlere (Halle) und kleine Location (Club) parallel bespielt. Hier kann es jeweils schon mal sehr voll werden, aber auch hier kommt man fast immer problemlos hinein, weil hier die eher unbekannteren Bands spielen und parallel Autogrammstunden mit den bekannteren Bands stattfinden. Es ist im Vorfeld manchmal eine Gradwanderung den angemessenen Slot und die Zugkraft einer Band abzuschätzen, aber ich denke, das gelingt überwiegend gut bis sehr gut. Meines Wissens konnten wegen Überfüllung nur bei Mgła (2016) und Batushka (2017) nicht alle Fans in die Halle gelassen werden. Das macht den einen oder anderen Auftritt noch exklusiver und lässt sich bei unterschiedlich großen Locations auch nicht komplett vermeiden. An dieser Stelle ein Tipp an die Fans: Nutzt von Anfang an die Außentreppe hinter dem Imbiss, um auf die Galerie im Club zu kommen. Hier ist oft noch viel Platz, während sich unten alles staut! Wie gehst du generell mit Kritik seitens der Fans um? Kritik seitens der Fans, aber auch positives Feedback, Bandwünsche und so weiter finden immer Gehör und bei Bedarf wird natürlich nachgebessert. Einige Besucher kritisierten in der Vergangenheit vor allem das mangelnde Essensangebot und die zu lange Schlage am Imbissstand. Hier wurde 2018 dank eines zweiten Stands für mehr Auswahl, Abwechslung und kürzere Wartezeit gesorgt. Was viele aber nicht wissen: Noch mehr Essensstände können auf dem Gelände leider nicht untergebracht werden, weil sie Notausgänge und Rettungswege versperren würden. Die Fans können sich jedenfalls sicher sein, dass kaum eine Entscheidung dem Zufall überlassen wird. Viele Zuschauer kommen mittlerweile von weit her zum DARK EASTER METAL MEETING – hast du dafür eine Erklärung? Was war die weiteste Anreise, von der du gehört hast? In Deutschland und vielen anderen Ländern sind die beiden Festivaltage sowie die Tage davor und danach Feiertage. Zudem sind Osterferien. Das bedeutet, dass die Leute Urlaub und Zeit haben und gemütlich an- und abreisen können. Außerdem sprechen die interessante und internationale Bandauswahl für sich. Ich bin aber schon platt und auch ein bisschen stolz, dass so viele Fans aus so ziemlich allen Ecken Deutschlands und der an Deutschland angrenzenden Länder, aber auch aus Osteuropa, Skandinavien und weit entfernten Ländern wie den USA, Mexiko oder Neuseeland zum DARK EASTER METAL MEETING nach München reisen. Nicht nur die Ticketnachfrage ist riesig – auch die Bands stehen mittlerweile Schlange, um auf dem DARK EASTER METAL MEETING aufzutreten. Nach welchen Kriterien suchst du die Bands aus? Zum jetzigen Zeitpunkt sind schon knapp ein Fünftel der Tickets verkauft und Anfragen von interessierten Bands kommen täglich. Beides ist sehr erfreulich. Eine Bewerbung führt jedoch nur selten zu einem Auftritt. Ich begebe mich nämlich sehr gerne selbst auf die Suche nach spannenden Bands und habe meistens schon viele Ideen im Hinterkopf. Bei der Auswahl ist für mich nicht wichtig, ob die Band bei Label X unter Vertrag steht, bei Festival Y gespielt hat oder in (Online-)Magazin Z Erwähnung findet. Natürlich verfolge ich das auch, aber in vielen Fällen ist es meinen persönlichen Stimmungen, meinem Geschmack und meinem Bauchgefühl geschuldet, weshalb es eine Band ins Programm schafft und eine andere nicht. Oft inspirieren mich auch Gespräche mit Freunden und Leuten aus der Szene oder der Crew. Ein wichtiges Kriterium ist auf jeden Fall, dass die besagte Band nach Möglichkeit nicht an jeder Steckdose oder in jedem Bushäuschen spielt. Oft sind echte Live-Raritäten oder noch unbekannte Bands dabei, die erst später steil gehen. Wie tust du solche noch unbekannten Bands auf, wie viel Zeit investierst du in die Suche? Die Bands, ob noch unbekannt oder schon bekannter, Jahr für Jahr ausfindig zu machen, ist sehr viel Arbeit. Mein Ansatz ist, dass das DARK EASTER METAL MEETING mit seiner Mischung aus legendären Szenegrößen und Undergroundhelden sowie vielversprechenden, noch unbekannten Newcomern und Perlen aus der ganzen Welt die größtmögliche Vielfalt innerhalb der abgesteckten Genregrenzen aus Black-, Dark-, Death- & Doom-Metals abbildet. Hast du vom Veranstaltungsort, dem Backstage München, ein festes Budget, mit dem du arbeiten kannst? Was war die bislang teuerste Band auf dem DARK EASTER METAL MEETING? Es gibt einen groben finanziellen Rahmen, der aber auch Spielräume lässt. Zuletzt haben die jeweiligen Tagesheadliner Paradise Lost sowie Bloodbath zu Buche geschlagen. Und über welche Zusage hast du dich persönlich am meisten gefreut? 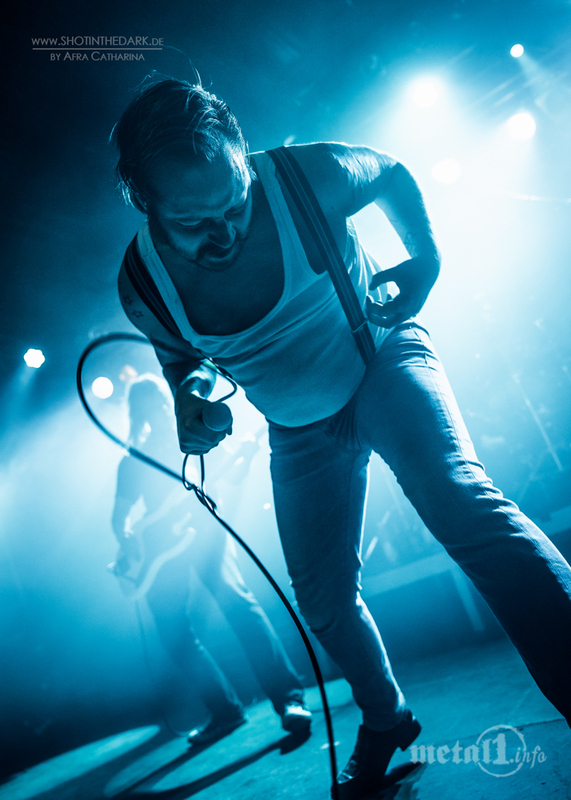 Was war dein persönliches Konzert-Highlight auf dem DARK EASTER METAL MEETING und gab es schon mal eine DEMM-Show, die dich wirklich enttäuscht hat? Auf Katatonia hätte ich mich sehr gefreut! (lacht) Als „Ersatz“ spielte nach deren Absage dann Paradise Lost – eine Band, die mich seit Teenagertagen begleitet. Auch wenn ich Paradise Lost schon fast zehn Mal live gesehen habe und ihr Auftritt am DARK EASTER METAL MEETING leider nicht zu den besten zählt, hinterlässt es ein sehr besonderes Gefühl in einem, plötzlich Gastgeber dieser Legende sein zu dürfen. Absolute Highlights für mich waren die beiden Auftritte von Bethlehem 2013 und 2018. Es lagen übrigens auf den Tag genau fünf Jahre zwischen diesen beiden Shows. Jürgen Bartsch ist ein richtig cooler Typ und fühlt sich eigenen Aussagen nach sehr wohl am DARK EASTER METAL MEETING. Allgemein freue ich mich auch über die vielen Zusagen von Bands, die es zwar bereits jahre- oder sogar jahrzehntelang gibt, aber es aus unerklärlichen Gründen noch nie (Bloodbath, Asphyx, Aura Noir …) oder seit Ewigkeiten nicht (My Dying Bride, Naglfar …) nach München geschafft haben. Grundsätzlich freue ich mich aber über jede Zusage des handverlesenen Programms. Spontanabsagen gehören zu den Horrorszenarien für Festival-Veranstalter – wie sicherst du dich dagegen ab? Dagegen kann man sich nicht absichern, zumindest machen wir es nicht. Jedoch sollte man im Falle eines Falles gut mit lokalen Bandmitgliedern und Booking-Agenturen vernetzt sein. Oft kündigt sich eine Absage bereits Wochen vorher an und man hat noch genug Zeit zu reagieren. Ich denke, es grenzte fast an ein kleines Wunder, dass wir 2018 für Katatonia, Taake und Helheim in kürzester Zeit ein „Alternativprogramm“ bestehend aus Paradise Lost, Shining und Aura Noir aus dem Hut zaubern konnten. So ein Glück hat man wohl eher selten. Ich erinnere mich beispielsweise daran, dass ich 2017 nach der Absage von Gehenna tagelang dutzende Bands angefragt hatte, bis die erlösende Nachricht in Form einer Zusage von Ravencult kam. Letztendlich ist man heilfroh über jede Band, die binnen kurzer Zeit einspringt. 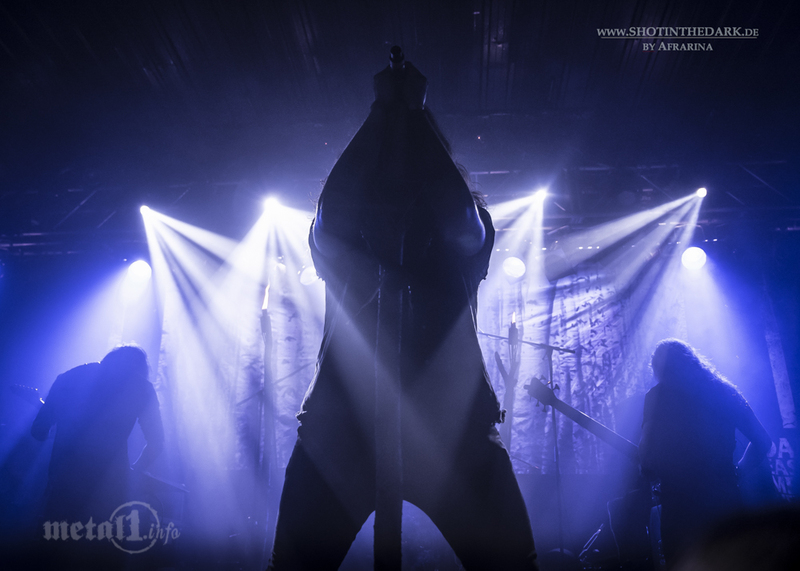 Großen Dank an dieser Stelle an die Jungs von Asphagor und Wolves Den, die 2018 nach der extrem kurzfristigen krankheitsbedingten Absage von Dawn Of Disease und den in der Versenkung abgetauchten Nocturnal Depression spontan eingesprungen sind. Beide Daumen sind gedrückt, dass 2019 wieder alles nach Plan läuft, aber da steckt man leider nicht drin. Wann beginnt für dich nach einer Auflage die Arbeit an der nächsten Ausgabe des DARK EASTER METAL MEETING – und womit geht es los? Die Arbeit ist ein steter Prozess und beginnt bereits vor der kommenden Ausgabe mit Überlegungen zum Programm, ersten Buchungen, dem Sichten und Beantworten von Bewerbungen und vielem mehr. Wie weit sind die Planungen aktuell fortgeschritten? Aktuell steht mit 29 von 34 Bands ein Großteil des Programms bereits fest. Unter anderem bestätigt sind Triptykon, Unleashed, Taake, Tsjuder, Necrophobic, Harakiri For The Sky, Darkened Nocturn Slaughtercult, The Ruins Of Beverast und Sear Bliss. Besonders gespannt bin ich persönlich auf Advent Sorrow aus Australien. Die eine oder andere Überraschung gibt es aber noch. Wenn das Booking abgeschlossen ist, enthüllen wir das neue Flyer- und Plakatdesign, gehen verstärkt in die Werbung und arbeiten an weiteren Details für die nächste Ausgabe. Man darf also gespannt bleiben. Wie viele Helfer sind mittlerweile beim DARK EASTER METAL MEETING alles in allem involviert? Die Vorproduktion machen Daniel vom Backstage und ich. Das Booking, die Korrespondenz mit Bands, Händlern, Medienpartnern, die Betreuung der Facebookseite und vieles andere mache ausschließlich ich. Außerdem gibt es noch unseren Grafiker, der die gesamte Vorproduktion über diverse Aufträge erledigt, sowie das Team vom Backstage, das beispielsweise die Ticketsysteme betreut, die technischen Anforderungen der Bands checkt und so weiter. Seit einiger Zeit gibt es auch eine Beauftragte für unseren neuen Account bei Instagram. Während des Festivals sind dankenswerterweise zehn bis fünfzehn ehrenamtliche Helfer aus der hiesigen Metalszene – darunter teils langjährige Freunde von mir – zur Bandbetreuung, als Stagehands, Merchandise-Verkäufer, Aufbauhelfer, Springer und vieles mehr, sowie für ihre Arbeit bezahlte Ton-, Licht- und Monitorechniker, Produktionsleiter, Backliner, Stagemanager, Shuttlefahrer, Bar-, Catering- und Securitykräfte involviert. Wie viel Zeit steckst du persönlich in das DARK EASTER METAL MEETING und bekommst du diese vergütet, oder ist das Ganze für dich immer noch ein reines Hobby? Was treibt dich an, wenn nicht das finanzielle? Sehr viel Zeit. Ich habe die Stunden, die ich am DARK EASTER METAL MEETING arbeite, noch nie addiert, aber es ist durchaus ein zeitaufwendiges Hobby. Mein Antrieb war jedoch noch nie finanzieller Natur. Es ist vielmehr ganz allgemein die Liebe zur Musik und zu Konzerten sowie den vielen Fans und Bands aus der ganzen Welt, die einem ein persönliches Lob für die Organisation und Dank für die Einladung aussprechen, geschuldet, dass ich das Jahr für Jahr mache. Was ist die witzigste Anekdote aus der Veranstaltungsgeschichte des DARK EASTER METAL MEETING? Eine witzige Anekdote der Crew ist beispielsweise die Geschichte mit der „verschwundenen“ Aftershowpizza für Batushka. Weniger witzig, dafür ziemlich skurril war die Sache, als mich ein Mitglied einer relativ bekannten Band während der Vorproduktion in E-Mails augenscheinlich grundlos beleidigt hat und mir Gewalt angedroht hat. Er trank offensichtlich ab und an ganz gerne einen über den Durst. Wir konnten das dann aber vor Ort persönlich klären. Die Band hat sich bei uns wohlgefühlt, einen richtig starken Gig gespielt und alles war gut. Hättest du nach der ersten Ausgabe gedacht, dass das DARK EASTER METAL MEETING eine solche Instanz in der deutschen Indoor-Festivallandschaft wird? Nein. Es war nach der ersten Ausgabe auch gar nicht geplant, dass das DARK EASTER METAL MEETING jährlich stattfindet, aber verschiedene Faktoren haben dazu geführt, dass es so gekommen ist. An dieser Stelle mal herzlichen Dank an alle Beteiligten, dass es so gekommen ist. Neben dem DARK EASTER METAL MEETING veranstaltest du auch das TANZT!, eine Konzertreihe für Mittelalter- & Folk-Rock/-Metal, sowie das Metallic X-Mas. Welches der drei Events würde dich als Musikhörer persönlich am meisten interessieren? Was läuft bei dir daheim oder im Auto? Es wäre wohl das DARK EASTER METAL MEETING! (lacht) Im Auto höre ich meistens Nachrichten oder auch mal gar nichts. Daheim sowie live höre ich am liebsten zeitlosen Metal, Rock und Pop von den 70ern bis heute mit dem Schwerpunkt auf den vergangenen Jahrzehnten. Die Liebe zu Musik und Konzerten wurde mir in die Wiege gelegt. Meine musikalische Sozialisation begann im Kleinkindalter mit Künstlern wie Bruce Springsteen, Meat Loaf, Supertramp, Gianna Nannini, Peter Maffay und unsagbar vielen anderen. Mein erstes Rockkonzert war 1994 – im Alter von acht Jahren – The Hooters, mein erstes Metalkonzert war 2003 im Alter von siebzehn Jahren Iron Maiden. Im selben Jahr sah ich außerdem inspirierende Konzerte von den Rolling Stones, Bruce Springsteen, Meat Loaf, Bon Jovi, Deep Purple, Whitesnake, Jethro Tull, Alice Cooper, Yes, R.E.M., Placebo und einigen anderen. 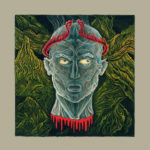 Diesen „Mittelalter-Kram“ – anfangs Schandmaul und Subway To Sally – entdeckte ich in etwa zur selben Zeit und zum extremen Metal fand ich erst mit etwa 20 Jahren mehr und mehr Zugang. Ich mag ziemlich viel verschiedenes Zeug. Auch deshalb unterscheiden sich zum Beispiel das DARK EASTER METAL MEETING und das TANZT! komplett voneinander. Helene Fischer: Wir haben Ostern Thomas Gabriel Fischer wieder mit dabei. Ich hoffe, die sind nicht verwandt!? Osterfest: Für mich seit 2012 gleichbedeutend mit dem DARK EASTER METAL MEETING. Wacken: Ich war noch nie da, möchte aber zumindest ein Mal dort gewesen sein. Dein aktuelles Lieblingsalbum: Im Black Metal „The Cleansing“ von Asphagor (2018) und „Letters From The Edge“ von Sear Bliss (2018). Im Metal allgemein „Firepower“ von Judas Priest (2018). Satanismus: Wie jeder Glaube mehr Schein als Sein. DARK EASTER METAL MEETING in 10 Jahren: Ich habe keine Ahnung. Vielleicht nicht mehr existent, vielleicht auch nur wieder ein kleines Eintagesevent. Danke für die Möglichkeit des Interviews und eure zuverlässig Arbeit als Präsentator des DARK EASTER METAL MEETING!